Although mosquito-borne disease is rare in Illinois, mosquitoes can carry at least three encephalitis viruses that can cause human disease. 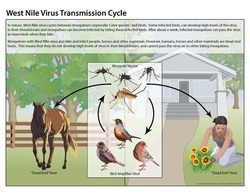 In 2001, West Nile virus (WNV) was detected for the first time in Illinois in birds, horses, and mosquitoes. West Nile virus causes encephalitis primarily in older adults. A mosquito feeds on a bird infected with WNV. The mosquito then carries the virus for approximately two weeks, then it is able to transmit the virus to animals and humans via a bite. 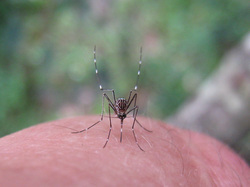 When the mosquito bites and feeds, the virus may be transmitted into the bite victim. The virus may then multiply and cause illness. Various agencies take part in mosquito control and prevention through fogging, spraying, or spreading solid products, which can include larvicide briquets, in areas that mosquitoes are a problem or are more susceptible to harboring mosquitoes. Spraying and fogging will only kill mosquitoes that come in contact with the chemical and will only control mosquitoes for a short time period until the spray or fog dissipated. Applying larvicides to breeding areas is a longer-term control method as it will help kill mosquitoes in the larval stage before they reach adulthood. Agencies also conduct surveys to determine the abundance of species of mosquitoes in the area, and some also use various methods to collect mosquito specimens to test for diseases such as West Nile virus. 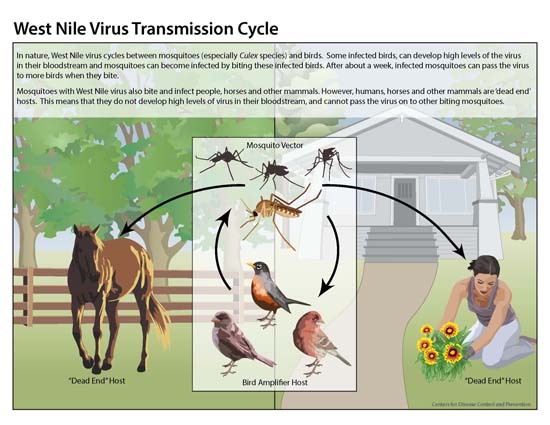 In addition to WNV, mosquitoes can also transmit diseases such as malaria, dog heartworm, dengue, yellow fever,eastern equine encephalitis (EEE), St. Louis encephalitis (SLE), LaCrosse encephalitis (LAC), and western equine encephalitis (WEE). *Use insect repellents when you go outdoors. Repellents containing DEET, picaridin, IR3535, and some oil of lemon eucalyptus and para-menthane-diol produ...ct provide longer-lasting protection. *Wear long sleeves and pants from dusk through dawn when many mosquitoes are most active. *Install or repair screens on windows and doors. If you have it, use your air conditioning. *Help reduce the number of mosquitoes around your home. Empty standing water from containers such as flowerpots, gutters, buckets, pool covers, pet water dishes, discarded tires, and birdbaths.